When the first platforms were being built off Great Yarmouth the living conditions were very poor: workers describe living in metal transport containers with no toilet facilities. 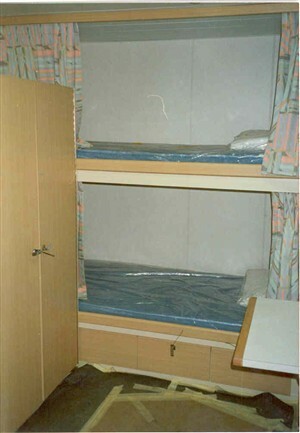 As the industry grew the conditions imporoved with many people only sharing two to a cabin. 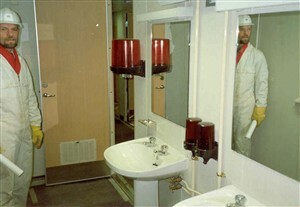 Later on facilities such as television rooms and gyms were added to make life as comfortable as possible for the crews working on board. 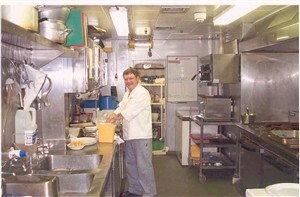 The canteens are open 24 hours to cater for workers on the night shift. The menus offered are extencive and workers are pretty much able to chose what ever they fancy to eat. All the workers who have spoken to us have had nothing but praise for the catering provided. The photo with the steward preparing food is myself this was a retirment party I was preparing. You have me down as a steward where upon I am a Unit Manager the retirement party was for a chef J.Curry.